Please contact us at info@kasvapress.com for international orders or larger quantities. 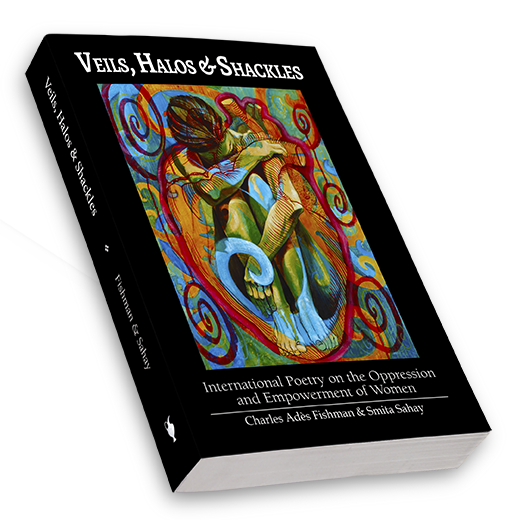 Veils, Halos & Shackles is available to bookstores and other “trade” outlets through our distributor. So wonderful to see this book coming out, wonderful work Charles and Smita. Can’t wait to see it! So honored to have work in your anthology, Smita and Charles. The cover is stunning. I am getting an error message when I try to purchase through this link. Could you send a message to info@kasvapress.com? I’ll make sure someone gets in touch with you to resolve the issue. I’m so honored to be associated with such a wonderful group in such a powerful anthology. Blessings sisters & brothers everywhere! I am proud to be associated with this project. My gratitude to the Editors: Prof Charles and Smita. I’ve bought copies, not because my poem is there, but because it spoke to the hearts of men about the pains inflicted on women and humanity.